Egg whites, isomalto-oligosaccharide* (prebiotic fiber), organic sunflower seeds, cold pressed organic palm oil, water, vanilla, orange pulp, caramel emulsion, sea salt, monk fruit. (*Isomalto-oligosaccharide are prebiotic fibers derived from plant sources). Contains: eggs. Made in a facility that processes tree nuts. Beef albumin, isomalto-oligosaccharide* (prebiotic fiber), chocolate, organic sunflower seeds, water, orange pulp, vanilla, cocoa, peppermint emulsion, monk fruit. (*Isomalto-oligosaccharide are prebiotic fibers derived from plant sources). Contains: eggs. Made in a facility that processes tree nuts. Egg whites, isomalto-oligosaccharide* (prebiotic fiber), organic sunflower seeds, water, cold pressed organic palm oil, orange pulp, cinnamon, vanilla, maple emulsion, sea salt, monk fruit. (*Isomalto-oligosaccharide are prebiotic fibers derived from plant sources). Contains: eggs. Made in a facility that processes tree nuts. Egg white powder, prebiotic fiber (from tapioca), sunflower seeds, water, cold pressed organic palm oil, orange pulp, vanilla, cocoa powder, *stevia, sea salt. (*Organic). Contains: egg. Made in a facility that processes tree nuts. Egg whites, isomalto-oligosaccharide* (prebiotic fiber), organic sunflower seeds, water, cold pressed organic palm oil, orange pulp, vanilla, maple emulsion, sea salt, monk fruit. (*Isomalto-oligosaccharide are prebiotic fibers derived from plant sources). Contains: eggs. Made in a facility that processes tree nuts. Hydro Beef™ Protein (Grass-Fed), Organic Prebiotic Fiber (From Tapioca), Blanched Almonds (Ground), Organic Coconut Oil, Vanilla Extract, Chocolate Extract, Organic Stevia Leaf Extract, Sunflower Lecithin. Hydro Beef™ Protein (Grass-Fed), Organic Prebiotic Fiber (From Tapioca), Sunflower Seeds (Ground), Organic Coconut Oil, Vanilla Extract, Chocolate Extract, Peppermint Oil, Organic Stevia Leaf Extract, Sunflower Lecithin. Egg White Powder, Organic Prebiotic Tapioca Fiber, Organic Sunflower Seed Butter, Organic Cinnamon (Ceylon), Organic Cinnamon Flavor, ProDura™ (Probiotic), Lou Han Gou (Monk Fruit). Egg White Powder, Organic Sunflower Seed Butter, Organic Prebiotic Fiber (From Tapioca), MCT Powder (Coconut), AAKG, L-Arginine, Espresso Flavor Extract, Organic Colombian Coffee (Ground), Organic Green Coffee Bean Extract, ProDura™ (Bacillus Coagulans 15 Billion CFU/g), PurCaf® Organic Caffeine (From Green Coffee Bean), Lou Han Gou (Monk Fruit). Egg White Powder, Organic Prebiotic Tapioca Fiber, Organic Sunflower Seed Butter, Organic Donut Flavor (Vanilla & Maple Extract), ProDura™ (Probiotic), Lou Han Gou (Monk Fruit). Egg White Protein, Organic Prebiotic Fiber (From Tapioca), *Sunflower Seeds (Ground), *Pure Vanilla Extract, Lou Han Gou (Monk fruit), Produra™ (Bacillus Coagulans-Probiotic). Hydro Beef™ Protein (Grass-Fed), Organic Prebiotic Fiber (From Tapioca), Cashew (Ground), MCT Oil, Organic Coconut Oil, Glutamine, Produra™ (Bacillus Coagulans-Probiotic), Vanilla Extract, Hazelnut Extract, Organic Stevia Leaf Extract, Sunflower Lecithin. 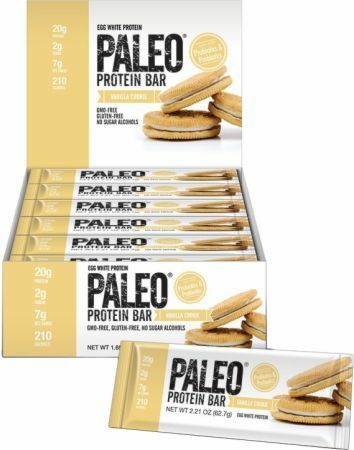 Get chisled with help from our signature 100% Paleo protein bars. A great addition to your training diet or as an on-the-go snack or meal replacement. Low-carb, high-fiber, high-protein (20g Protein), GMO-free, grain-free, gluten-free and sugar alcohol-free. Lab-tested by an independent, third-party institution for quality and nutritional accuracy, and packed with great flavor! Offered in nine delicious flavors and with two different protein sources. Beef-based protein bars include Almond Fudge, Chocolate Mint and Vanilla Pudding flavors. Egg-based protein bars include Devil’s Food Cake, Glazed Donut, Vanilla Cookie, Blueberry Tart, Espresso and PURE Sunflower Butter.